There are many different types of elegant wedding tent rental options that can be used for your wedding day. Depending on your guest count, style and wedding location, you might find yourself overwhelmed with choices. If you are searching for a wedding or reception tent in the Greater Cincinnati area and are looking for a rental company that puts the customer first, you are in the right place. 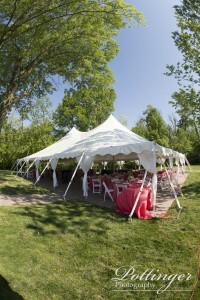 All of our wedding tent rental inventory is cleaned and well maintained. By utilizing our ‘A Gogo quality control’ processes while setting up and taking down our tents, we ensure that our tents stay clean and white so that they will be ready for your wedding! We also offer wedding dance floors, wedding chair rentals, wedding linen rentals and more to compliment the tent and fulfill your wedding day needs. Congratulations on your upcoming wedding and we look forward to working with you!